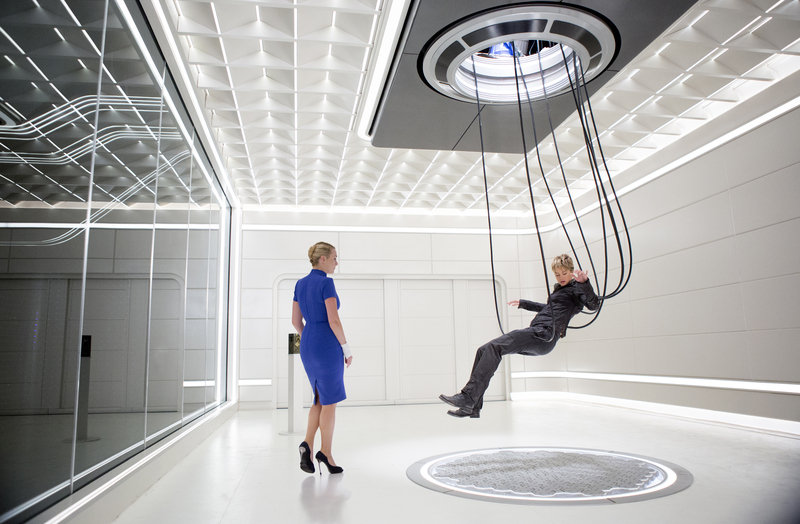 Jeanine (Kate Winslet, left) and Tris (Shailene Woodley, right) in THE DIVERGENT SERIES: INSURGENT. ©Summit Entertainment. CR: Andrew Cooper. HOLLYWOOD—Shailene Woodley reprises her role as rebellious outcast Tris Prior in “Insurgent,” the second installment of the big screen adaptation of the futuristic action adventure young adult novels by Veronica Roth. Shearing off her long locks at the beginning of the sequel, Woodley is in fighting form as a rare Divergent, someone who doesn’t fit neatly into one of five societal classifications or factions in a fictional post-apocalyptic Chicago. Accompanied by boyfriend Four (Theo James, reprising his role) and a handful of other renegades who have managed to escape Jeanine (Kate Winslet, also returning), the power-hungry leader of the Erudite faction, part two opens with Tris holed up on the far reaches of the walled city amongst the more peace-loving Amity types. Tracked down by Jeanine’s army, Tris and her friends narrowly escape by a passing train headed back to the city, where they don’t make friends with some rebels calling themselves the Factionless. Heartsick and guilt-ridden over the deaths of her family and friends, Tris tries to uncover the secret her parents sacrificed their lives to protect, which turns out to be the reason why Jeanine will stop at nothing to capture her. Darker, and more violent than the first film, “Insurgent” required a lot more of the young actress both emotionally and physically. Q: What was it like to get back into Tris and how do you think she changed? Woodley: Getting back into Tris was more difficult than I anticipated because I didn’t take into account that I myself had grown for a year and I figured getting back into her would be simple because I would just go back into that mindset. My personal mindset had progressed a year in evolution so I had to go back to who Shai was a year prior in order to get back into Tris’ mind. Q: Can you talk a little bit about the training and how it compared to the first film? Woodley: For the first movie, we did a lot of choreography and a lot of fight training. This was more basic sort of fitness there wasn’t really anything too intense. Q: Out of all the action sequences that you did, which one made you feel the toughest? Woodley: There’s one really rad sequence when Tris is climbing around her house (which is spinning in a whirlwind) and I think one day we had four or five stunt doubles. There were just a bunch of women with short hair in the same exact outfit walking around; it was really funny. But I got to do a lot of the stunts when the house is tilting. We were on wires and would slide down. There was one where the house was tilted at almost a 90-degree angle and that felt pretty tough because I was like, “If I don’t grab this pole I’m not going to get hurt, but I’m going to be dangling in the air with a crazy bad wedgie.” So, yeah, that was pretty fun. Q: What is your favorite part about Four and Tris’ relationship? How is does their relationship differ from real couples? Woodley: One of the reasons I fell in love so deeply with “Divergent” was the relationship between Tris and Four, because it was grounded in truth and respect and authenticity. It wasn’t based on surface level physical attraction or infatuation. Tris and Four equally saw each other as individuals they were inspired by, individuals who they were intrigued by and curious about. There was a sense of mystique about each of them. I find it fascinating. 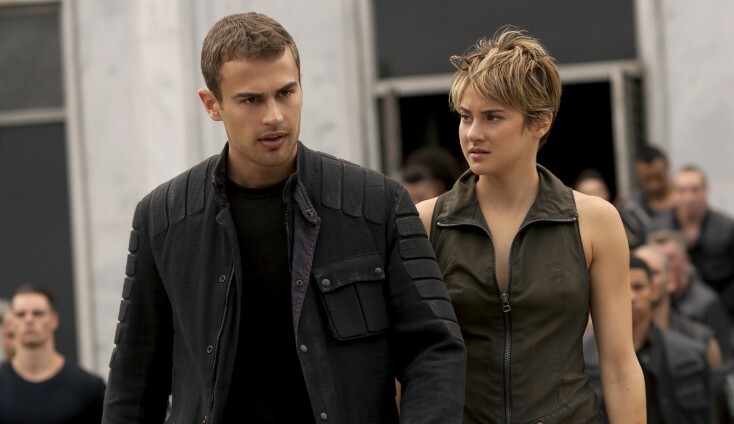 I loved that—in “Insurgent”—their relationship is rocky; it’s not 100 percent. It’s not every time they see each other they feel safe and they feel protected and they feel like they’re able to be vulnerable. They put up walls against each other, and that happens in partnerships. Everything has an ebb and flow, and I thought that was one of the smartest things Veronica (Roth, the author) could have gifted to the young adult world. Yes, there are lots of books that do that as well, but to have that involved with an action film or with an action series is quite rare. I just think it’s great to have a platform for not only young adults, but also everyone to recognize that relationships can be based in truth and be vulnerable. Yet, at the same time, when your walls go up, just to recognize that you’re keeping somebody at arm’s length because of your own defenses, and not because of anything that they are doing. That’s all defense mechanisms are: an ability to protect our own inner vulnerabilities. Q: What was it like working with Robert Schwentke, who takes over from Neil Burger, who helmed the first one? Woodley: When we first found out Neil Burger wasn’t going to be doing the second film it was a little strange to wrap your head around how somebody else would fill those shoes because Neil created the visual world of “Divergent.” He took Veronica’s book and added all the visual aspects to it, breathed life into it. Robert, first off, is a genuinely warm, pure human being and he makes you feel immediately comfortable and he doesn’t have an ego, so he’s very open to collaboration. He’s also open to hearing what you have to say and taking your opinions into account, which I think is such a blessing. If somebody new had come in, had this very strong idea of what they wanted and didn’t care about what you thought, there would have been a lot of intensity around the situation.